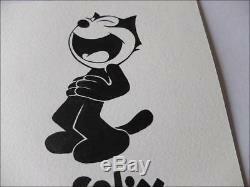 1980's, felix the cat laughing. 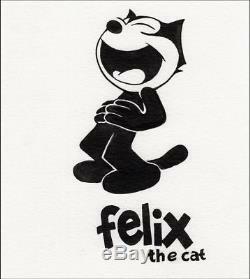 The most famous cartoon cat! 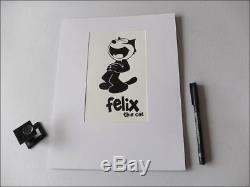 Felix is ​​a cartoon character born of otto messmer's imagination and produced by Pat Sullivan. 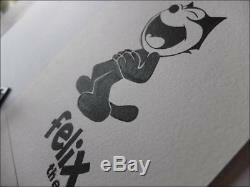 The series had international success throughout the 1920s, but with the advent of American talking films and the creation of mickey mouse, Félix quickly lost its popularity. Félix reappeared later on American television in the 1960s under the direction of Joe Oriolo. In comics, the first regular comic strip issue in Sunday newspapers is in the daily sketch in England, August 1, 1923, in a weekly series of 12 episodes. King features syndicate authorizes the series to republication throughout America from August 19, 1923. 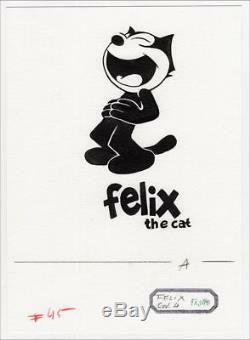 Full-length portrait of Hilarious Felix. Small original sketch with the ink of China. Drawing used for the cover of an American card catalog. Creation studio archive, circa 1980. Annotation in a cartouche: felix cov. Size: 26 cms x 19 cms, inset on board 24 cms x 30 cms with mat for immediate supervision. 1 euro, without reserve price! 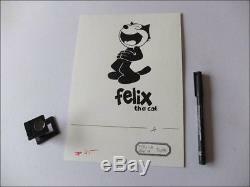 The item "felix the cat laughing original drawing ink cover catalog usa" is on sale since Monday, January 7, 2019. It is in the category "art, antiques \ art of the twentieth, contemporary \ drawings, wash". The seller is "vintagephotos" and is located in / besançon. This item can be delivered anywhere in the world.